With cloud-based products growing at an incredible rate, it becomes more of a challenge for any organization to keep abreast of all of the cloud options and make intelligent decisions as to what cloud capabilities are the best fit for their short and long term strategic goals. More and more organizations are investigating using a cloud broker. 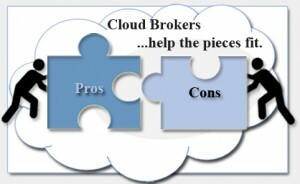 A cloud broker can indeed help clients translate business and technology needs into cloud solutions, but as is true of any broker client relationship, there are pros and cons involved in enlisting the help of a cloud broker. The definition of a cloud broker has evolved over the past five years. Organizations are rethinking the concept of cloud broker as they review options around moving applications to the cloud. Along with the initial broker definition of technical support and overall technical management, there has emerged another definition that adds a stronger consultative role. The need for a “trusted advisor” to evaluate service providers, options, and platforms has emerged – the business cloud broker. The business cloud broker functions in an advisory role, manages the contractual relationships with vendors on behalf of the organization, and is concerned with billing and the ongoing value proposition for the client organization. By contract, the technical cloud broker drives the technical aspects, and aggregates services from disparate vendors. Value comes from a cloud clearinghouse where a team of experts monitors new cloud technologies and helps you identify your cloud needs and help you differentiate between the many offerings in the marketplace. A cloud broker, as your trusted agent, can take the time to understand your existing structure, understand your business requirements, map existing and future processes and ensure that all solutions align with your business objectives. A cloud broker can handle the financial and billing aspects of the cloud services. This aspect may not apply to all organizations or federal and state agencies. At a minimum, however, they would be identifying the cost model and how it could be implemented. This management approach and the consolidated accounting capability can simplify the overall management of cloud. Some organizations also rely on the broker to develop the best cost model for the services needed, leveraging the best rates for cloud resources, depending on demand and overall resource needs. Cloud brokers have gone beyond a simple technology replacement approach. The broker can also help your organization move into cloud technologies that will not only alter your organization’s business model, but also allow your organization to release and redirect more resources to its core mission (e.g., by reducing the costs of data centers as an example). This can only happen with a detailed understanding of the cloud industry and an ability to innovate and apply cloud technologies in ways that have not been done in the past. Cloud brokers are also well positioned to build pragmatic business cases for cloud, with concrete parameters and metrics to demonstrate direct and indirect cost savings and benefits. A broker is positioned to evaluate the technical and business process pros and cons of any given cloud technology, given your organization’s resources, environment, and any challenges or gaps that might impact successful implementation. The greatest negative in using a cloud broker is your organization’s reliance on an individual or a small team (the broker) to be continuously up to date on new cloud technologies, options and offerings. Using a cloud broker also adds complexity. For example, the broker is a layer between the cloud service providers and your organization. Will the cloud broker understand and adapt to your security requirements throughout the entire delivery chain? Your organization needs to develop a thorough understanding of any security ramifications and make sure the broker addresses these concerns and clearly understands the security issues inherent to your industry and to your organization. Your organization needs to ensure that the broker is consistently representing your best interests (i.e., is transparent in any relationships with cloud or technology providers). In order to ensure objectivity, is it critical that the broker chosen has no conflicts of interest with any cloud offering that is recommended. Another potential disadvantage may be the ongoing nature of the cloud broker relationship. Your organization will be dependent on the broker; as a consequence there must be terms and conditions that support your organization in changing brokers (e.g., data portability, Client technical/business environment schematics, etc. ), as the relationship with the broker changes. Understanding the power of the cloud, the different and evolving roles of business cloud broker and technical cloud broker, and how cloud can be applied to your organization will be critical in any broker relationship. The cloud is elastic, always available, and can scale to meet the needs of any organization. A credible cloud broker will always search for solutions that scale, and can be managed with a known, predictable cost model. In addition, a good cloud broker will help you to anticipate needs and take advantage of cloud technologies that fit your business and mission needs. For more information on TBI’s Cloud Computing, please contact TBI or you can reach us at: 201.573.0400. This entry was posted in Blog and tagged Cloud brokers, cloud clearinghouse, cloud resources, cloud service brokers, data center costs, IaaS, PaaS, SaaS. Bookmark the permalink.